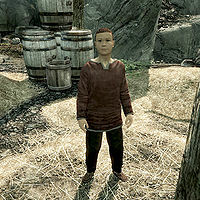 Blaise is a Breton child who works and lives at Katla's Farm near Solitude. He sleeps outside on a hay pile in the stables. "You probably want someone else. I'm just the stable boy." "I take care of the horses. And the goats. And the chickens. And the garden." "Talk to Geimund if you want a horse, or Katla if you're looking for work. I can't help you." If you ask him how he likes the farm, he'll be quite open and tell you "I hate it. Everyone feels sorry for me, so they don't treat me too bad, but..." If you ask him to elaborate, he'll explain "Both my parents were in the Legion. There was... an ambush. Katla said she could feed me if I could make myself useful. I take care of the animals, run errands, that kind of thing. I guess it could be worse. But... I'm sick of sleeping outside with the horses. I want a real home, real parents. Not... this." You will then have a dialogue option to adopt him. You can only go through with the adoption if you have a house with a child's bed and container. This page was last modified on 28 May 2014, at 12:31.